A private sushi class in your own kitchen. Learn real Japanese sushi techniques with your friends and family – it’s fun and educational! 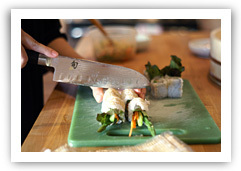 We will come to your kitchen – all you need to have is a cutting board and knife. If you are a serious learner, or are looking for a fun party idea, these classes are perfect! Sushi rice making technique + Fish cutting technique. Let’s hear what Mike Sutter (Austin American-Statesman) and I said about Austin’s trailer food phenomenon.